Faster Repair Service–Road-Ready in No Time! We know how it feels to find a hidden treasure, whether it be a restaurant, doctor, or auto body shop. We’re an intimate, highly experienced, and expert auto body shop in Hooksett that you might not know exists! NCA Auto Body Repair in Hooksett has qualified techs that have been providing exceptional services for over 25 years. Hopefully, you won’t/don’t find yourself on either end of an auto collision. While we can’t prevent accidents from happening, we can give you back a vehicle that looks just as good, if not better. The first time you bring us your vehicle, you’ll wonder how you ever got by without us. Your wrecked vehicle won’t stay that way for long at NCA Auto Body Repair. Expect quick and complete body work that turns your accident into a distant memory. We’ll return your vehicle to its condition moments before a collision. A strong engine that’s running smoothly is just as important as a body that’s looking great. NCA Auto Body Repair knows that accidents can happen whenever you’re on the road, and it can even happen when you’re parked. We’re just happy you’re okay. And we also know you’ll have plenty of questions, especially if you’ve never experienced an accident. We have all the answers to any minor or major vehicular impact: “Can I choose any repair shop for auto body services?”, “Does NCA Auto Body work on my make and model?”, “Do they work with all major insurance companies?” The answers are “Yes!” “Yes!” and “Yes!” Our crew has nothing but good news for you when you arrive at our shop. We also want you to know your rights. Don't let your insurance company pressure you into using "their" repair facility. It's your right as a customer to go to any auto body shop you'd like. You have a choice as to which auto body shop you use, and at NCA Auto Body Repair we want you to know that we work for you, not your insurance company. All you want is your car back, and we’re the quickest path to full restoration. We’ll have you back on the road in no time! You need a team that’s on your side! At NCA Auto Body Repair, you’re not just another job. You’re a member of our community, and we want you behind the wheel of your vehicle as quick as possible. Every concern that owners have about their damaged car is handled by our team. We’ll work with your insurance company and keep you informed throughout the process. From dings, dents, and scratches to fender benders, collisions, and total losses, we give you back a car that drives and looks good as new, even better! We even make unsightly scrapes and scratches go away. 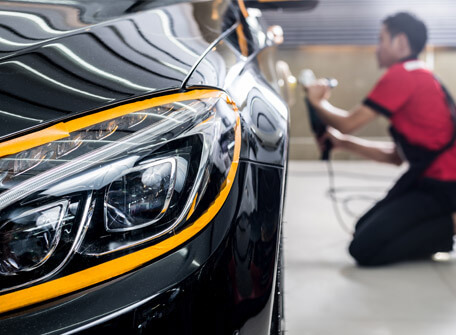 NCA Auto Body Repair finishes its auto body work with quality paint services. Give us a call today to reverse your vehicle’s collision, fender bender, or paint scratch. To save yourself some time, go ahead and schedule your appointment right now using our convenient online scheduling system. Why Choose NCA Auto Body?